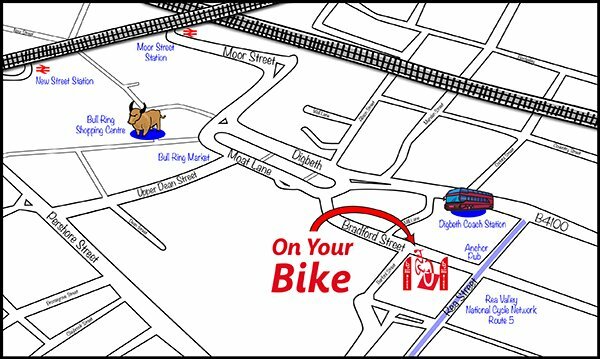 On Your Bike is 5 minutes walk from the Bullring shopping centre. Head down the centre of the Bullring towards St Martins Church. From the church, you will see the open air market. Walk down the left hand side of the market - this is Moat St. As you walk down Moat St you will see Sing Fat Chinese supermarket where the road splits. Take the right branch - this is Bradford St. OYB is situated on the right hand side of the road before you get to the traffic lights at the junction with Rea St (by the Anchor Pub). Buses 2, 12 and 31 stop directly outside OYB on their way out of the City centre. Buses 50, 50A and 650 stop directly outside OYB on their way in to the City centre. From New St or Moor St stations follow walking signs to the Bullring. From here, follow the walking directions above. Both stations are a 10 minute walk from OYB. We have a small car park for customers' use whilst in the shop. From the Ring Road (S). Take the B4100 (Digbeth High St) towards the City Centre. Take a left turn immediately before the National Express Coach Station on to Rea St. At the traffic lights turn right on to Bradford St. OYB is set back from the road immediately after the bus stop on your left, 50 metres after the junction. From Bristol Rd (A38) (S). Turn right onto the Ring Road (A4540) then immediately left onto Sherlock St. Follow this to a mini roundabout then turn right. Follow this road as it meanders round to a T junction. Turn right here on to Bradford St. OYB is set back from the road, immediately before the bus stop on the right hand side of the road, 50 metres from the junction. From the Aston Expressway (A38) (N). Leave the A38 at the Ring Road (A4540) and take the first exit at the roundabout. At the next roundabout, turn right on to the A47. Follow this road as it meanders down towards the Bullring. With the Selfridges building on your right, the road bends round to the left. Follow this, then move in to the right hand lane in order to fork right at the traffic lights. As you go through the lights you need to be in the left hand lane in order to turn immediately left on to Bradford St. OYB is set back from the road, after a right hand turn and immediately before the bus stop on the right hand side of the road. Note to Birmingham City Cycles customers following their closure: Please note that On Your Bike are more than happy to support customers who have purchased or ordered a bike from Birmingham City Cycles only to be disappointed when Birmingham City Cycles closed down. Please contact us to discuss ways in which we can help.